Climate literacy is low across the U.S., and where there are great examples of climate action in the San Francisco Bay Area, there exists a different narrative on a national level. Educators, scientists, and practitioners, like those in attendance at the latest BayCLIC workshop, face these and other barriers when broaching topics of climate change. 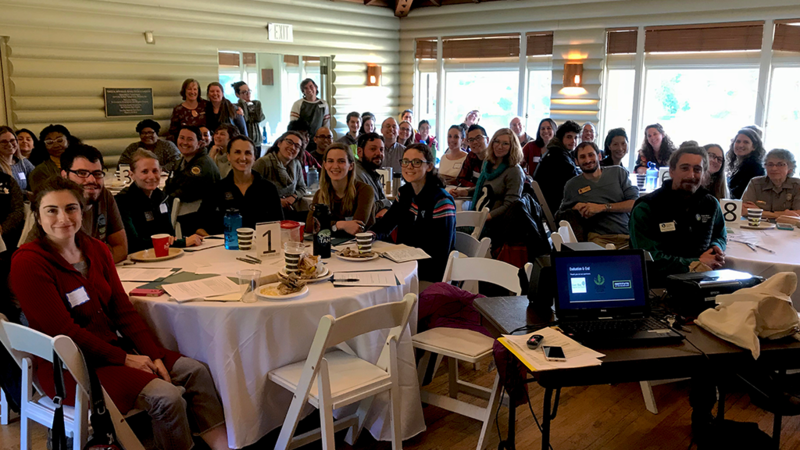 Yet, the 70 participants at Dig Deep into Extreme Events were undeterred in their efforts to learn how to best communicate the ecological and social implications of extreme climate and weather events. It was a proud moment realizing our workshop had provided useful guidelines for communicating these extreme occurrences. Participants were given steps on how to best connect their audiences to the information, starting with framing the message around values proven to resonate across demographics. Research from the FrameWorks Institute found two values that connect with most people are preparedness and responsible management. When calling on the shared value of preparedness, discuss the possible impacts of extreme events and how preparation for these risks can limit their negative impacts. It is particularly effective to frame the risks of extreme events around the health and well-being of the people and places we cherish. The second value, responsible management, addresses how practical actions can safeguard natural resources and places. These proactive actions can benefit future generations in addition to current ones. Finally, as acknowledged by one of our speakers Mike Moran of East Bay Regional Park District, changing perspectives on climate impacts and framing them in ways that are optimistic and fun can empower many people to act. After peaking interest and gaining the trust of the audience, begin explaining the causes, impacts, and consequences of climate change. As Adam Ratner, Guest Experience Manager at The Marine Mammal Center, described, the key to making your point about climate change is to start at the very beginning—like how burning fossil fuels emits carbon dioxide (CO2)—and explain each step from there. The National Network for Ocean and Climate Change Interpretation (NNOCCI) calls this process the “explanatory chain.” When connecting the dots between climate change and extreme events, focus on what is known rather than uncertainty. Use a phrase like “climate change is making torrential downpours like the one we are experiencing now more severe and frequent.” When confidently stating that climate change contributes to extreme weather events overall, the link between the two is more convincing than focusing on the inconclusive findings for a specific event To help the audience follow the explanatory chain, employ metaphors and analogies like the heat-trapping blanket and regular vs. rampant CO2. I encourage you to look at the website climateinterpreter.org and search the phrases “heat-trapping blanket” and “rampant CO2” for more information. The primary goal of climate change communication is to engage your audience with the solutions presented at the conclusion of your explanatory chain. It may seem that piecing together the narrative around climate change is the end goal , but as we learned from Adam in the solutions messaging activity, it is not! We may think that the process of climate change is important to know and retain, and while that is true, ending with actions that can be taken to limit the risks of extreme events gives your audience motivation to retain the information and to act on it, avoiding fatalism. So, offer audiences community solutions. Solutions can include supporting bike-share programs, encouraging workplaces to install LED lightbulbs, or even talking with others about climate change. I hope that I’ve given you a few helpful tips for doing that. Other resources on climate communication can be found on BayCLIC’s Local Climate Science Database at bayclic.org. I recommend reading the report “How to Talk about Climate Change and the Ocean” by FrameWorks Institute; the “Uncertainty Handbook” by Climate Outreach; and the various resources on climateinterpreter.org.